When Rob Lowe joined the cast of Parks and Recreation as the positive energy-spewing Chris Traeger, he proved to TV audiences that his comedic talents were stronger than they’ve ever been. He’s now co-leading the new Fox comedy The Grinder, and while this show isn’t as funny or quirky as that Pawnee-set series, Lowe’s presence is thankfully as captivating as it needs to be. Now it’s just up to the writers to catch up. 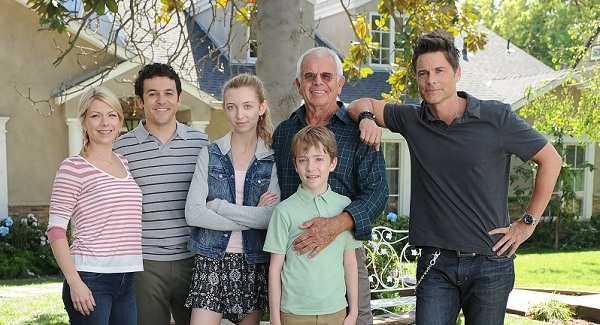 The Grinder has one of the most sitcommy plotlines currently on TV. Lowe plays Dean Sanderson, Jr., the star of a hit courtroom drama, also called The Grinder, in which he played a lawyer (also called Grinder) who was basically infallible. Now that the show has come to an end, he’s having a mild any-point-in-life crisis where he isn’t sure what to do with himself. Thankfully, his family is there to serve as an inspiration. Dean’s brother Stewart, played by Fred Savage, is an attorney within the family’s law firm, and even though he’s competent in the job, he relies on notecards help him in his cases and has some confidence issues. Enter Dean, who doesn’t have any legitimate legal education, but he’s spent the past nine years handling a huge assortment of cases on TV, and that’s basically all he thinks he needs to know. And considering his star status within his hometown, not many are going to tell him otherwise. Except for Stewart, that is. Stewart is basically the only person who has a problem with Dean’s new life path. Stewart’s wife Debbie, played by It’s Always Sunny in Philadelphia’s Mary Elizabeth Willis, is an old flame of Dean’s and just wants Stewart to keep an open mind. The brothers’ dad Dean, Sr., played by William Devane, sees nothing wrong with his TV star son boosting the image of his law firm. Stewart and Debbie’s kids Ethan (Connor Kalopsis) and Lizzie (Hana Hayes) are also definitely into having their uncle around more. He just seems to make everything better. If I had to guess, I’d assume that every other episode of The Grinder will play out exactly like the pilot, at least from a court case perspective. Stewart has a case and wants to do one thing, while Dean comes in with a different gameplan, using a TV episode as proof that his idea will work. It works, and Stewart is forced to eat his words. There’s nothing necessarily wrong with this, and I could of course be wrong about it, but The Grinder doesn’t seem like the kind of show that will start pushing any major narrative boundaries in its first season. Thankfully, things begin with enough generally good jokes that I’m optimistic the rest of Season 1 will deliver laughs on a regular basis. Part of the fun in the first episode was the case itself, which saw comedy vet Brian Huskey as the plaintiff and Kumail Nanjiani as his lawyer. I’m hoping either Nanjiani is around as a regular character, or the show brings in a conveyor belt of comedic actors for each week’s case, because that’s a solid way to spread the humor around. Also, we’ve got Jason Alexander showing up in later episodes as the creator of the show-within-the-show, so it’ll be great to see him and Lowe bouncing off of each other. It’s been a while since we’ve seen Fred Savage in front of the camera, as the majority of his career in the past decade or so has been spent in the director’s chair for tons of episodes for comedies of all kinds. The last time he appeared in a live-action series, it was 2006’s Crumbs on ABC (which also starred Devane), and before that it was NBC’s Working from 1999-2000. It’s impossible for the actor to overshadow his days on The Wonder Years, given how relatively perfect that series was, but he’s always enjoyable to watch, as needlessly nebbish as he can sometimes be. Created by Allen Gregory creator Andrew Mogel and actor/writer Jarrad Paul, both of whom directed this year’s comedic drama The D-Train, The Grinder probably isn’t going to be the funniest comedy of the year to anyone, but at least it knows exactly what it’s doing with its central concept. Considering Fox doesn’t have anything happening in the comedy department outside of Sunday nights, I’m hoping the show builds upon its pilot in every way possible to make this talented cast a mainstay on TV. And if nothing else, at least we have “Grinder rests” as this fall’s new catchphrase. Get ready for all your objections to be overruled when The Grinder premieres on Fox on Tuesday, September 29.